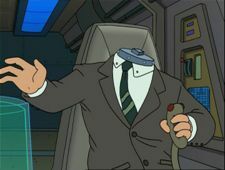 The headless body of Spiro Agnew was the Vice President during Richard Nixon's U.S. presidency, as well as the Vice President during his Earth presidency. Unlike his U.S. vice presidency, Agnew died while Earth Vice President. Nixon traded off Agnew to Wernstrom as a payment for the destruction of the robot party on the Galapagos Islands. However, as Wernstrom failed, he remained the Vice President. Agnew's fate was sealed during a game of miniature golf at Leo Wong's Wongminster, when the eco-feminist protest group, the Feministas, disrupted the play and accidentally killed Agnew with a run away golf cart. Despite the fact that Agnew is headless, he is still capable of making growling noises. Agnew's body was apparently cloned sometime between Into the Wild Green Yonder and "A Farewell to Arms". According to the commentary of "Crimes of the Hot", the idea for the character was from Eric Kaplan. Unlike most famous people, his body has been preserved without his head, instead of the other way around. He can be heard making noises, but it would seem he does not have vocal cords as almost all of his neck is missing. He is probably inspired by the Frankenstein monster, played by Boris Karloff in the 1931 movie "Frankenstein", as his grunts are very similar to the monster. He was born two days before the end of the First World War. This page was last edited on 27 June 2017, at 01:29.